For richer families in the 19th century meat such as venison or pheasant was a dietary staple, eaten almost every day with vegetables and rich sauce. Poorer families tended to eat meat only once or twice a week; even then it was strictly apportioned according to gender. Men were given more because they tended to work longer hours in more physically demanding work. In such a household, every scrap of meat would be saved and the bones boiled to make soups and broth. 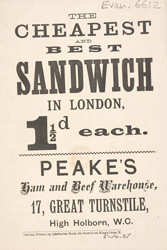 Butchers shops like Peakes were common in British cities.